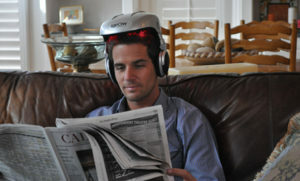 Laser Tek 9000 Hair Therapy utilizes low level laser lights for the treatment of hair loss and diseases of the scalp. The treatment increases blood flow to the scalp which stimulates cell metabolism and causes damaged cells to be repaired. FDA approved for men and women. What is Low Light Laser Therapy? Laser Tek 9000 treatments are a non-surgical, scientific approach to hair loss, utilizing therapeutic cold laser lights. Developed in Europe for the treatment of hair loss and diseases of the scalp, the Laser Tek 9000 has now been FDA approved for cosmetic use in America. The treatment delivers light energy directly to the scalp to increase bloodflow. The laser functions on the same scientific principal as photo biotherapy where the laser light stimulates cell metabolism and causes damaged cells to be repaired. This breakthrough technology has recently been featured on national newscasts across the USA. Physicians are praising this technology as an effective treatment to combat hair loss. What are the benefits of the Laser Tek 9000? Is Laser Tek 900 Therapy safe? Yes! The Laser Tek 9000 Therapy device which is classified as a Certified Class lllA cosmetic laser is recognized by the FDA and is approved for cosmetic use in the United States and Canada. Products such as scalp treatments, topical hair growth stimulants, chemical-free shampoo conditioners, and nutritional supplements can be used to complement laser treatment or used alone. Fill in spots on the scalp with natural fibers. Safe, effective and long-lasting.